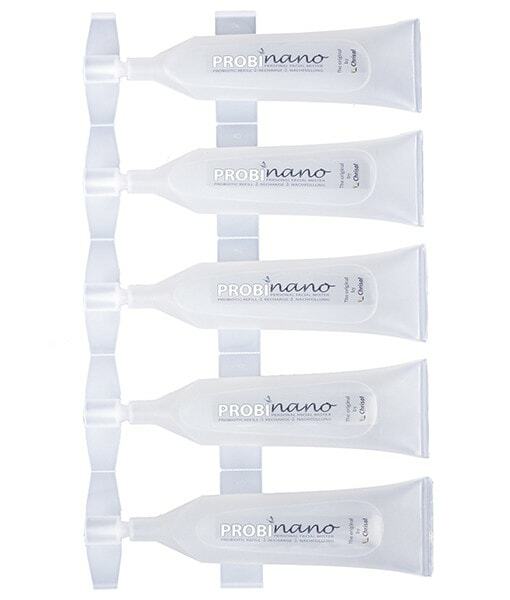 Probiotic refill ampoules for Probinano personal facial mister. Probinano Nanomister is a revolutionary ultrasonic mist spray developed to spray an extremely fine mist of Probinano probiotic liquid on the face. This liquid contains at least 50 million healthy bacteria per ml, that have an extremely beneficial effect on the skin and greatly reduce the risk of skin problems such as allergies, acne, eczema. Daily use of Probinano promotes healthy skin flora. Each time you use Probinano mist spray, you also inhale these probiotics. This is completely safe and even has additional benefits. Our sinuses and nasal cavity filter the air we breathe. They therefore often catch harmful germs and allergens from the air, which makes them vulnerable to infections and allergic reactions. When Probinano’s 100% natural probiotics enter the nasal cavity they establish healthy and stable microflora that reduce the risk of infections and actively break down allergens. The particle size of less than 1 micrometre creates a dry mist that spreads the probiotics optimally, allowing them to penetrate the deepest pores. Use Probinano probiotics daily for healthy skin flora and a good moisture balance. Healthy microflora is extremely important for your skin. They provide natural resistance and optimal protection. Your skin is put under great pressure by changing weather conditions and harsh hygiene and skin care products. If your skin flora is damaged, you may experience a range of problems or undesirable effects. Some illnesses also affect the skin, and these symptoms can get worse if the skin flora is not healthy. Probinano ensures healthy skin flora! Although skin and appearances may vary greatly between population groups, all skin types need proper care and healthy microflora. 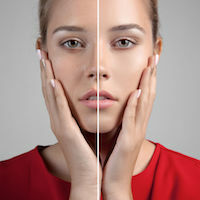 The probiotics in Probinano fluid have been selected for their ability to adapt to strongly fluctuating circumstances (dry skin vs greasy skin; acidity). All skin types will benefit from using Probinano and having healthy skin flora. The probiotics in Probinano are 100% safe for everyone, including pregnant women and children. Pregnant women and adolescents in particular can gain extra benefits from using Probinano mist spray because they often experience skin problems like acne due to their fluctuating hormone balance. It is extremely important to keep the skin flora of this target group in optimal condition. The mist produced by this product is enriched with 100% natural probiotics and is completely safe. This probiotic liquid has been dermatologically tested at universities. Inhaling the mist significantly reduces the risk of infection in the nasal cavity, sinuses and respiratory tract. Each time you use Probinano mist spray, you also inhale these probiotics. This is completely safe and even has additional benefits. Our sinuses and nasal cavity filter the air we breathe. They therefore often catch harmful germs and allergens from the air, which makes them vulnerable to infections and allergic reactions. All skin types will benefit from using Probinano and having healthy skin flora. The healthy bacteria have an extremely beneficial effect on the skin and greatly reduce the risk of allergies. Acne due to increased numbers of the Propionibacterium acnes bacteria which produces irritants in the pores, leading to spots. The healthy bacteria have an extremely beneficial effect on the skin and greatly reduce the risk of acne. The healthy bacteria have an extremely beneficial effect on the skin and greatly reduce the risk of eczema. The probiotics in Probinano are 100% safe for everyone, including pregnant women and children.